Please visit Patter's blog HERE to read what she has shared for this fortnight's challenge. I had chosen my scripture but had not found what to also include on my digital piece of artwork. Then this afternoon I read a small devotion from "One Quiet Moment" by Lloyd Jon Ogilivie and the Lord pointed out what I should share on my page. God's timing is so perfect. I have been busy lately with my digital scrapbooking and next month I open my first digital store which is within a digital scrapbooking online store. I really felt the Lord lead me to do this as it came about in a way I had not been looking for. For two years I have been designing mini kits which I give away on my other blog ( A-M ) as part of a small group of other Christian Designers and it was through this that I was offered to become a paid Designer. I have been dabbling in designing since 2009 and have taken part in two designer contests. The last one I competed in I made it to the last round and pulled out as I felt I was not ready to be involved in selling my designs. Now I am ready - the Lord prepared me for it - I just needed to be patient and wait for His timing. In the store I am about to start selling at there is another Christian Designer who is fairly new at designing and I have taken her under my wing and have been helping and encouraging her. 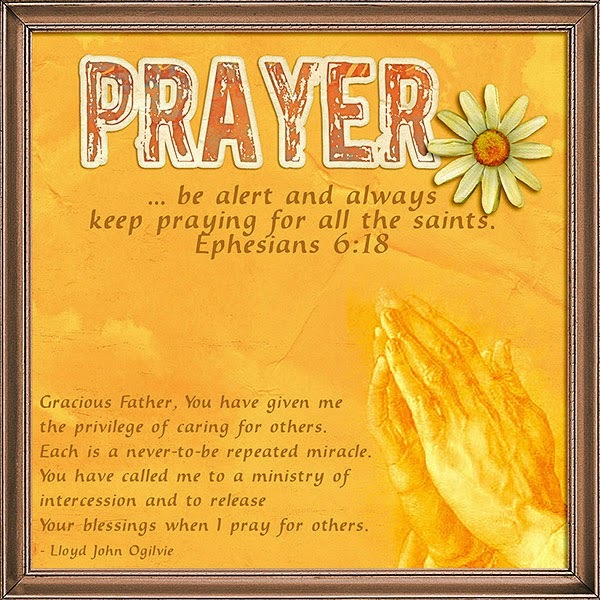 Digital products - frame by Laitha; wordart, paper and flower from Prayer and Praise by Thao Cosgrove. Image of the praying hands found on the internet.